Unique ID Labels and Service Help Return Stolen Bikes to Owners. Bicycles are always a popular holiday gift, and the National Bike Registry (NBR®), the only nationwide bicycle registration and recovery service of its kind, can help protect shoppers' bicycle purchases. It is all done by identifying and registering the bike with a simple, effective, and low-cost ID label. 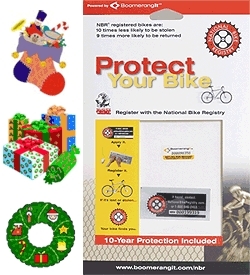 NBR offers the gift of security for a bike for only $10 for 10 years. With the NBR service, a bicycle owner applies the tamper-resistant, serialized security label, then records the serial number and a description of the bike in the NBR secure database by phone, mail, or online. NBR bike registration packs can be obtained at participating retailers, police departments, or online at www.nationalbikeregistry.com and www.boomerangit.com. Often just seeing an NBR label can deter a thief, who knows it will be harder to resell an obviously stolen bike. The finder of a bicycle, either the police or a Good Samaritan, calls 800-848-BIKE or accesses the NBR website to trigger a notification to the owner. "NBR is perfect for consumers who want to safeguard their new, and not so new, bikes this season. It makes a great gift for cycle-loving friends and associates," said Eddie Orton, president of NBR. "Bicycles are an investment, and that is why we offer a solution to protect them. Our affordable service is already working for more than 300,000 registered bikes." The NBR database is available to law enforcement agencies so if the bike is found by a law enforcement officer, it can be easily cross-referenced with the owner's information for a quick return. NBR's national scope enables police to match bikes to owners, no matter where they were stolen and recovered. NBR is the official bicycle registration service of the National Crime Prevention Council and McGruff® the Crime Dog and a portion of sales benefits its "McGruff® the Crime Dog" crime prevention programs. For more information or to place an order, contact NBR at 800-848-BIKE, ext. 105.